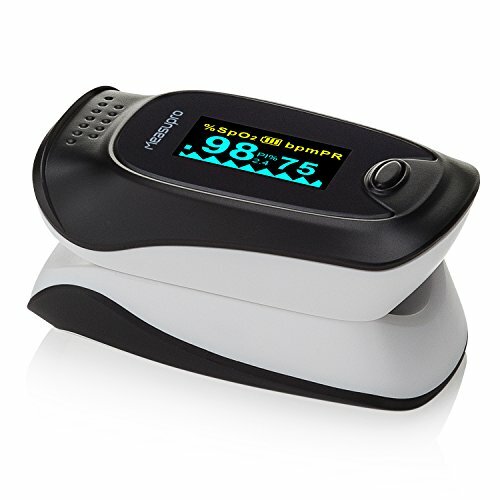 A suitable alternative to blood gas testing, the pulse oximeter is a cheaper alternative to going to a lab to get your blood drawn, especially if you don’t like needles or have enough healthcare insurance. With a pulse oximeter, you have a simple and painless way to determine your blood oxygen level so you can prevent health issues before they occur. Here are a few tips on what to look for in the best pulse oximeter and a few reviews to help you start shopping. 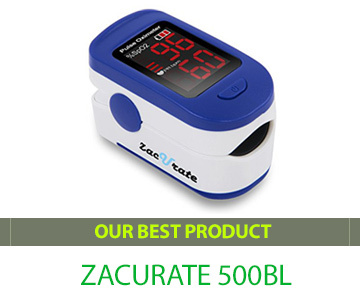 Using FDA and CE standards, the Zacurate 500BL is a popular choice among health professionals. It was designed for sports enthusiasts and pilots who need to find out the Pulse Rate (PR) and Blood Oxygen Saturation Levels (Sp02) while on the go. This is a handy device that has a large LED display that faces you allowing you to read it easily. You only need to clip it to your finger and turn it on to read it easily and with its small size, you can easily carry it around. The Zacurate 500BL is accurate for SpO2 reading up to +/- 2% following FDA standards. It also comes with an infrared shield protecting the device from the environment to guarantee that you are getting accurate readings. Battery changes are a quick and easy with the snap-off battery cover so you can remove and replace batteries without any hassle. The Zacurate 500BL has a finger chamber that uses the Smart Spring System so it can accommodate a wide variety of finger sizes. It also comes with a convenient lanyard, 2 AAA batteries allowing you to use it as soon as you receive it, and a twelve-month warranty. If you are looking for a reliable and accurate oximeter, the Innovo Deluxe iP900AP contains both the Perfusion Index (PI) and Plethysmograph in the same unit. It can determine when is the best time to take a reading so you won’t have to wonder if your reading is accurate. The PI will tell you how strong your pulse is notifying you if you are too cold or not position correctly. The plethysmograph gives you a visual representation of your heartbeat with a continual waveform notifying you of a good blood flow. The display on the Innovo is multi-directional giving you six different layouts to choose from adding to the unit’s versatility and ease of use. You can also set an auditory alarm to notify you when your rates are beyond the set limits. 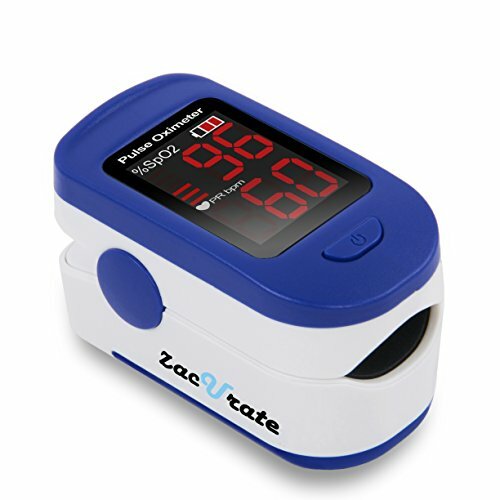 This oximeter is designed for sports and aviation use and can be used in recreational settings, sports settings, and home use. It might not work on kids or adults with small hands. The unit also includes 2 AAA batteries, a lanyard for added convenience, and a one-year manufacturer warranty. 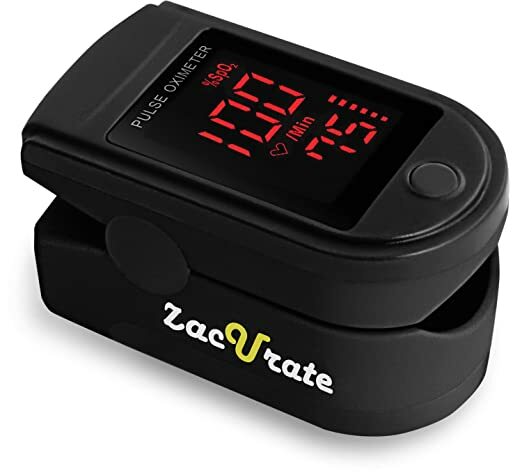 Created as an updated 50DL, the Zacurate Pro Series 500DL allows you to reliably and accurately find out your Pulse Rate, Pulse Strength, and your Sp02. With a design aimed for use by pilots and sports enthusiasts, it has a large LED display that faces you for easy readings in under ten seconds. The high-quality finger chamber is constructed of medical grade silicone that is latex free and hypoallergenic. You get easy readings by just clipping the device to your finger and turning it on with the press of a button. The Sp02 accuracy is +/- 2% following FDA and CD standards for health professional use. 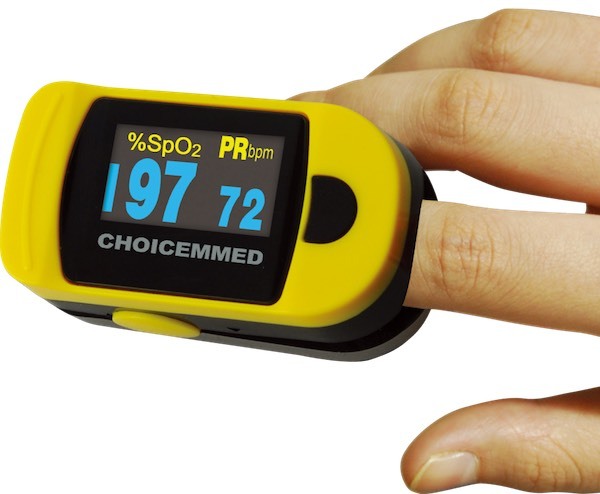 Hardware and software have also been upgraded and it is now the only LED pulse oximeter that displays up to 100% for SpO2 value. The Zacurate Pro Series 500DL also has easy battery removal and replacement with a fast snap-off battery cover. It is also able to accommodate a wide variety of finger sizes with the Smart Spring System. This portable device also comes with a lanyard, 2 AAA batteries, and a silicon cover that will protect it from dirt and damage. 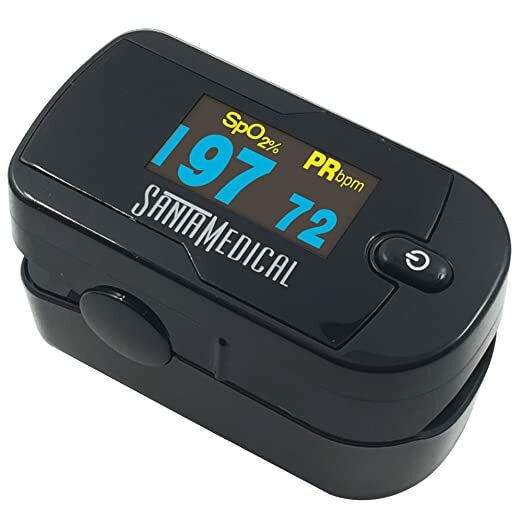 Capable of fitting a variety of finger sizes, the Santamedical Oximeter provides results in less than ten seconds. This is an accurate and reliable device that shows your results in real time. Affordable and precise, the FDA approved Santamedical Oximeter is a finger clamp that is self-adjusting. This is an easy to operate device that works with just the push of a button. Not only will it show the Pulse Rate and Sp02, but it uses a plethysmograph device which measures the change in the volume of your blood. This easy to use device gives you results in four different directions and includes six modes allowing you to view the display from any angle. The Santamedical is a very portable device thanks to its small size and the bright LED display allows you to view your results even in low light. You also get over thirty hours of continuous monitoring for each set of batteries you use. Equipped with a neck or wrist strap, you can easily take this unit with you when you are on the go. This is the perfect device to use for spot checks of blood oxygen and pulse rates when doing outdoor or recreational activities. Other features include an automatic power off and battery level indicator, and it comes with a user manual, 2 AAA batteries, and a one-year warranty. 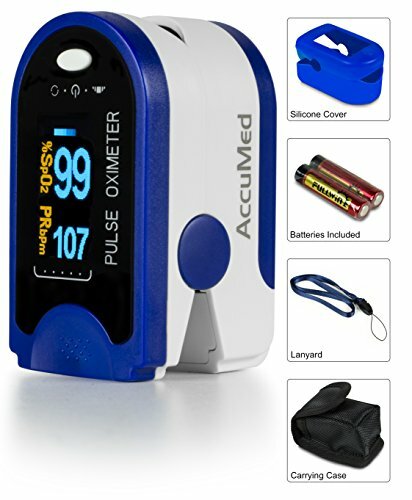 Have all your vitals at your fingertips with the Accumed CMS-50D Oximeter. This is an easy and quick device to operate by sampling aligning your finger with the red light and turning the oximeter on. Your results are available in just ten seconds giving you a non-invasive and painless reading of your pulse rate and blood oxygen level. Not only do you get your Sp02 level and Pulse rate, but the AccuMed also displays your pulse intensity as a bar graph while a pulse wave shows you the strength of your pulse. After five seconds of inactivity, the AccuMed powers off automatically giving you up to 32 continuous hours of battery life. This lightweight and portable design weighs only 50 grams and easily travels with a convenient travel case or on the included lanyard for easy access. The bright display on the AccuMed is clear, prevents ambient light washout, and rotates automatically by detecting your hand movement. This is a great device for travelers, pilots, or athletic enthusiasts. It fits all finger sizes from a four-year-old up to an adult. 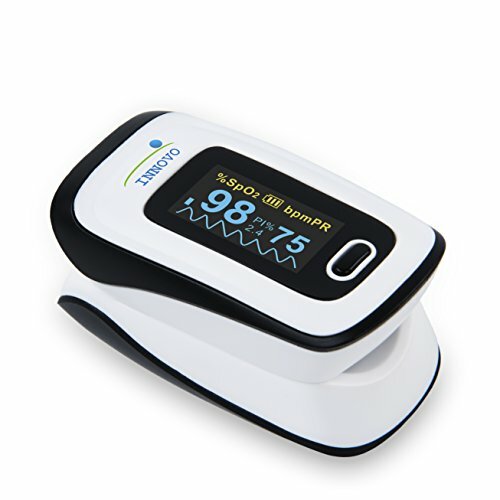 The user-friendly TempIR Finger Pulse Oximeter is a dedicated Sp02 and pulse oximeter device. Designed specifically for these function, it has advanced technology that is solely focused on these functions to give you a more precise reading. The display shows both readings in just a few seconds by using a non-invasive sensor to analyze the blood in your finger, plus it fits your finger perfectly with the spring system that is self-adjusting. Helping to enact early medical intervention that can stop future health problems, the TempIR has a large, multi-directional color display allowing you to easily see results from any angle. This portable and small device comes with a protective pouch making it easy to take it with you wherever you go. It also uses photoplethysmography or waveforms as well as a perfusion index to confirm that your Pulse Rate and Sp02 has been taken properly. This affordable and robust device is constructed with high-density ABS plastic and comes with a lanyard for easy access. The TempIR is easy to operate and only need a one button touch to set with alarms to indicate either a low or high reading. This is a great device for sports enthusiast as well as for home use. Receiving your results in just three seconds, the MeasuPro Pulse Oximeter is great for sports enthusiasts or those that travel a lot. Providing an accurate reading of your heart rate and blood oxygen saturation levels, you only need to turn it on and insert your finger into the clip to get an accurate reading within +/- 2%. Your results are displayed clearly on the large OLED screen that rotates allowing you six different angles to see the readings. Results are provided through a waveform called plethysmograph and a bar graph that gives you a numerical reading. You also get a perfusion index reading that tells you what your pulse strength is. This unit is constructed with a silicone material that is latex free and hypoallergenic. This lightweight and compact device is also very durable and comes with a fingertip clip that is cushioned fitting all sized fingers without any pain. Simply press one button to find out your results. The MeasuPro also comes with a lanyard so you have easy access to readings whenever you need it. A pulse oximeter works in a very simple way. By just clipping the device onto your finger, a light from the oximeter is emitted into your finger. 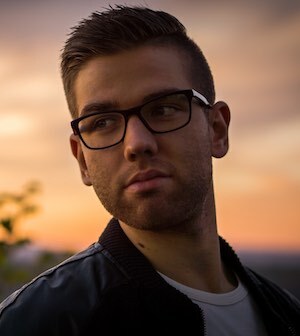 The emitted light has two different wavelengths of light that are absorbed by the oxygen molecules and hemoglobin that they are attached to and measured by a sensor on the other side. If the sensor is calibrated correctly, it can distinguish how many hemoglobin cells are in the blood that is passing the nearest artery and how many of the cells have an attached. This reading is called your peripheral capillary oxygen saturation also known as SpO2. If you have ever been out of shape, you know how difficult it can be to maintain oxygen levels when you have sudden heavy physical demands placed on your body. When you use a pulse oximetry device when you work out, you can push your body farther without worrying out about getting sick or placing your body to the point of complete exhaustion. Athletes in high altitude sports run the risk of oxygen deprivation so it is important to make sure you are aware of issues before they become a serious health problem. This includes sports like hang gliding, skydiving, or mountain climbing where being able to determine arterial blood oxygen levels is important and could save your life. Those that suffer from COPD where their lungs have become damaged and their body can no longer make repairs. With this condition, it is important to monitor blood oxygen levels to know when your lungs aren’t giving you enough oxygen and therapy or medication may be needed. Asthma attacks can also be debilitating and a pulse oximeter can let you know when your airways are becoming restricted before it becomes a serious issue. This allows you to use your inhaler before and asthmas attack happens. There are also other rare pulmonary conditions that affect the lungs and are life-threatening. A pulse oximeter can benefit these patients by alerting them to changes in their arterial blood oxygen levels a serious complication happens. After they are calibrated, a pulse oximeter will work the same for the next few years. After a startup check has been performed, their circuitry is never needed again. A pulse oximeter is usually very affordable with few costing over $50. Plus, the majority will come with a warranty. This makes the pulse oximeter one of the least expensive home health monitor devices you can find. The less invasive the better for most people, especially if the thought of needles causes them anxiety. Although it can’t tell you what your carbon dioxide levels are, a pulse oximeter can confirm if your oxygen levels are low when you are not feeling well letting you know it might be time to head to the hospital for treatment. If you have been counting your heartbeat with your two fingers, you are probably not getting the most reliable results. 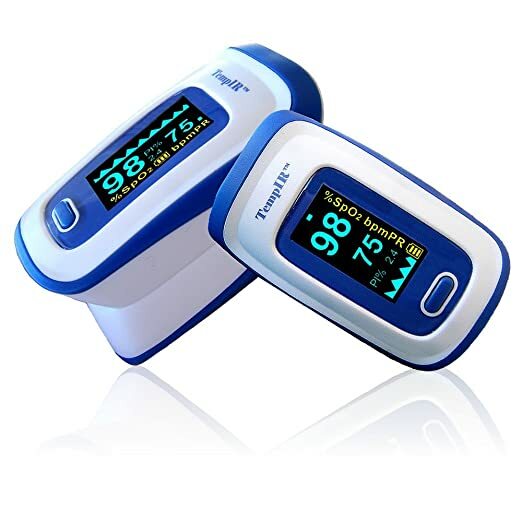 A pulse oximeter can give you more accurate and reliable results, especially if you are having serious issues like a racing heart or overexertion. Fingernail polish can hinder getting a correct reading, you may want to use an earlobe. Make sure to take your readings where there are low-light or normal conditions and avoid sunlight and bright overhead lighting. Don’t move while you are testing since body movement including sneezing and shivering can affect getting a correct reading. Remember that if you have circulatory or respiratory conditions, the readings you get from your pulse oximeter will need to be interpreted differently. You can find that information with the device’s user manual. And, always make sure to talk to your healthcare provider to on how to use the results you get from your pulse oximeter to correctly determine what is going on with your health. As you are shopping, you will want to find a pulse oximeter that is guaranteed within 2% (plus or minus) of actual SpO2 levels. It also needs to be accurate up to 70% oxygen saturation. This means that even if your arterial oxygen levels aren’t perfect, the pulse oximeter is still giving an accurate reading and you will know if you need to seek medical attention. Irregular Heartbeat – a warning alarm should sound if your heartbeat isn’t constant and steady including any heart arrhythmias that may be of concern. Low SpO2 – even though you will see a low number on the screen, you should also have a warning beep for low SpO2 concentrations. Especially since you can also have blurred vision or dizziness when you are suffering from inadequate O2 concentrations. Low Battery – this is also important, so the battery won’t just die when you don’t expect, especially for those that rely on an oximeter for disease management. Being able to carry your device with is important for most people who need to monitor their SpO2 with an oximeter. Those using it because they are a pilot or sports enthusiast, it is still handy to have the device in your pocket or around your neck. Since you are looking for portability, having a unit that may be small in size but heavy and uncomfortable to use doesn’t make it a great device to take with you all the time. A lightweight unit may be easier for you to carry on you, especially on a handy lanyard. Keep in mind though that the weight of the oximeter does affect how durable it is, especially since heavier units can get damaged when they are accidentally dropped. The difference between a cheap piece of equipment and something very durable can also mean the difference between life and death. You want a pulse oximeter that is durable enough to take a drop to the ground, being immersed in water, or have protection against humidity. When a pulse oximeter is damaged in any way, it can fail or give you inaccurate readings which can be life-threatening. If you have large fingers, an adjustable oximeter is a great choice, especially if you find non-adjustable units uncomfortable. You may find that you have to squeeze too hard or not hard enough with non-adjustable oximeters. With an adjustable brand, you are able to choose your comfort level so you aren’t dreading have testing throughout the day. Devices that turn on automatically when you insert a finger or toe is helpful, especially if you are weak from a low oxygen level and monitor your Sp02 frequently meaning the difference between life and death in some cases. Having a backlit display and font color combinations are great features to have in a pulse oximeter so you can see in the bad light. Adjustable brightness helps to work in any lighting condition while displays that have multiple viewing angles are very convenient so you aren’t straining to read the device. Since a pulse oximeter is incredibly accurate and inexpensive, having the ability to check your pulse and Sp02 at home is a no-brainer. Especially for those suffering from potential health problems, monitoring your heart rate and oxygen levels can make a big difference in how large a serious medical condition can become. This handy tool could mean the difference between taking some medication or ending up in the hospital for an extended stay.